Located a 5-minute car ride from Warsaw Chopin Airport, B&B Hotel Warszawa-Okęcie offers air-conditioned rooms with free WiFi and a flat-screen TV with satellite channels. 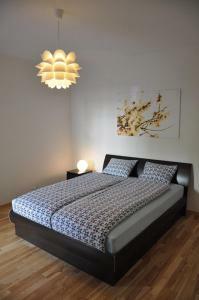 The rooms of the B&B Hotel Warszawa-Okęcie are modern and feature a classic interior design. Each one has a work desk and a private bathroom with a shower. In the mornings, a varied breakfast buffet is available. There is also a vending machine with a selection of beverages and there is a shop directly at the hotel. Hotel Witkowski price per day from 126 Family run Hotel Witkowski offers modern accommodation with homely atmosphere. The air-conditioned rooms come with a private bathroom with a hairdryer. After a busy day sightseeing or working, guests can relax in the cosy and intimate restaurant where they can enjoy Polish delicacies or international cuisine. The hotel is situated along highway E77, only 5 km from Warsaw Chopin Airport. 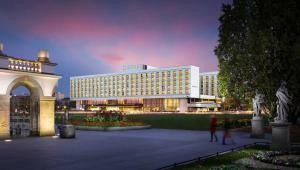 It is also 5 km from the central railway station, Warszawa Centralna. 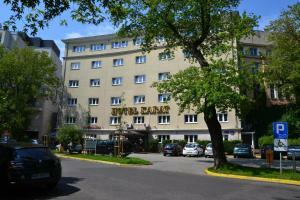 Hotel Colibra price per day from 171 Hotel Colibra is located only 250 metres from the Wola Shopping Centre. It features rooms with free wired internet and a private bathroom with a shower and a hairdryer. All rooms at the Colibra are fitted with a TV and a telephone. A buffet breakfast is served every morning in a hotel restaurant specialising in Polish dishes. The nearest bus and tram stop going directly to the centre is only 120 metres away. Restaurant Stary Dom , Warsaw Guest reviews: 9/10 ~ 4,8 km from B&B Hotel Warszawa-Okęcie Address: Pulawska 104/106, 02-620, Warsaw. Cuisine: Polish.